CD review: "The Hustle Is On: Imperial Sessions Vol. I"
This review first appeared in the November/December 1990 issue of Living Blues magazine. These tracks were all recorded between 1950 and '53, and showcase Walker at the peak of his talents. It's all here: the smooth guitar runs, the rich vocals, and the tight horn charts backing him. Listening to these recordings, and comparing them to what has come since, one is struck by how much Walker influenced contemporary blues. Not only did he set the model for Texas blues guitar (from Albert Collins and Johnny Copeland to Anson Funderburgh and ZZ Top), but his vocal style has influenced subsequent blues singers from every region. His vocals on "Everytime," with that relaxed, sonorous delivery and easy swing fronting a jazz big band show just how much B.B. King owes Walker. To be sure, Walker was influenced in turn by blues shouters like Jimmy Rushing and Joe Turner. But he was a contemporary of theirs, and their influence was not one-directional. Blues wasn't the only music Walker helped define; check out the guitar on "The Hustle Is On." Recorded in 1950, his twanging, distorted guitar foretold what Chuck Berry and others would be creating several years later. The interest in the music here is hardly limited to historic appeal; this is a very listenable album that shows why Walker was one of the most popular artists of his day. From "Cold, Cold Feeling" through "High Society" and "Bye, Bye Baby," the material contained here maintains a modern, accessible sound more than 40 years after it was recorded. 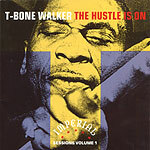 This album is one that serves many purposes equally: the novice blues fan, unfamiliar with Walker's work, will find "The Hustle Is On" to be a fine introduction, while the serious collector or historian will find the Imperial sides in CD format to be a blessing.